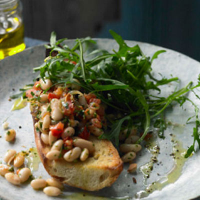 This easy recipe uses a tin of cannellini beans and diced tomatoes to make a Mediterranean version of an English favourite. Heat 1½ tbsp of the olive oil in a pan and gently fry the shallot for 2-3 minutes until softened. Stir in the chopped tomatoes and cannellini beans, then cook for a further 3-4 minutes until the tomatoes have just softened and the beans have heated through. Remove from the heat and stir in the parsley and red wine vinegar, then season to taste. Meanwhile, cut the bread lengthways into 4 x 1cm thick, long slices and toast under the grill until golden. Rub the toast with the cut side of the garlic and drizzle with the remaining olive oil. Cut in half and spoon the beans over. Great with Waitrose Peppery Rocket Salad.